Fargo was a big hit last year with an amazing first season that told a wonderful story that was similar but also different enough from the original Cohen Brothers movie with the same title. The show really worked in a short ten episode span and the cast took it to the next level. The highly anticipated second season is approaching soon and is scheduled to return this September. The first teaser promo for the second season, titled “Right From Wrong,” has been released and looks pretty damn good. Despite being only a collage of quick clips from the season, it showed enough to have me much more excited for Fargo Season 2 than I previously was. The first season of Fargo was very mystical in a way and felt like an old folktale thanks to Billy Bob Thornton’s Lorne Malvo. The show is focusing on a completely new plot each season with a brand new cast that should be just as good. The first promo already shows that this is going to be more of an eerie crime drama, and I believe it will be a lot of fun. Check out the clip above and let us know what you think! It’s not much, but are you excited for Fargo to return? Neve Campbell has joined House of Cards when it returns for its fourth season next year. The details on her character have been quiet, but the speculation right now is that the season will introduce a younger couple that compete with Frank and Claire. I think that this will be a good addition to the show and possibly be a plot that improves from the most recent season. I felt as though the story to be too repetitive in this third season and certain characters poorly written. I’m definitely planning on watching the new season, but will not be as excited as year’s past; however, the addition of someone like Campbell and the plot idea mentioned above could make things great again. No… you’re not reading the title of this post wrong… Joe Manganiello is up for the role of Deathstroke in the Suicide Movie that is coming out next year. Deathstroke is a major part of the DC universe and it would be pretty great to see the character on screen as early as next year, but I’m not sure about this casting. Manganiello has his moments, I guess, but really has seemed to be type cast as a buff guy in roles that never really have much depth. He’s popped up in roles over the years and most recent was in Magic Mike along with Channing Tatum which has a sequel coming out later this year. 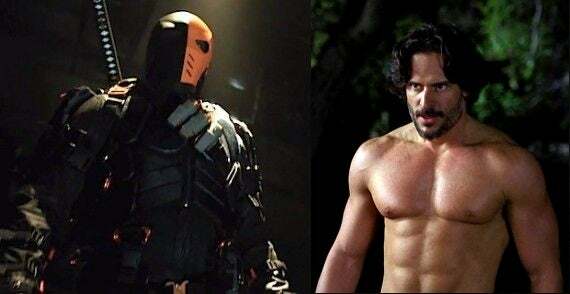 Manganiello is fine when he’s in a supporting role, but Deathstroke is a major villain for DC that deserves proper representation. You have The Rock playing Black Adam, and I would have expected someone equally as popular for this role. It’s not officially confirmed that Manganiello will be playing Deathstroke, but according to sources it’s his role to lose. Jason Clarke (Zero Dark Thirty, Dawn of the Planet of the Apes) is also being considered for the role, and personally, I would love to see his take on the character because I think he is a better and more versatile actor than Manganiello. Manu Bennett has been phenomenal in the Slade Wilson role on the CW’s Arrow, which leaves big shoes for the movie version of the character to fill. With most fans being frustrated at DC’s failure to combine their TV and movie universes like Marvel, all eyes will be on the actor with high demands.